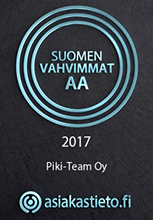 Asfaltin paikkaus ammattitaidolla | Piki-Team Oy | Pyydä tarjous! Mastic asphalt patching is highly suitable for traditional sled or manual distribution in the case of smaller traffic capacity roads, streets and courtyard areas for the repair of various grades of asphalt damage. Working widths 20-100 cm. Due to its elastic characteristics, rubber bitumen is well-suited for repairs to roads and streets in addition to pedestrian/bicycle paths and asphalt cracks in courtyard areas. The cracks are first cleaned with compressed air in order to obtain the best final result. Rubber bitumen sealing requires a higher working temperature than normal, as well as the continuous mixing of elastomer and limestone aggregates. Bitumen sealing is the most widely used, most economical repair method for national roads or motorways as well as lower-grade roads having asphalt cracks. The work is performed in the form of ‘pouring jug’ sealing. The method effectively prevents water access to the structural layers of roads. This way larger frost damage is avoided. 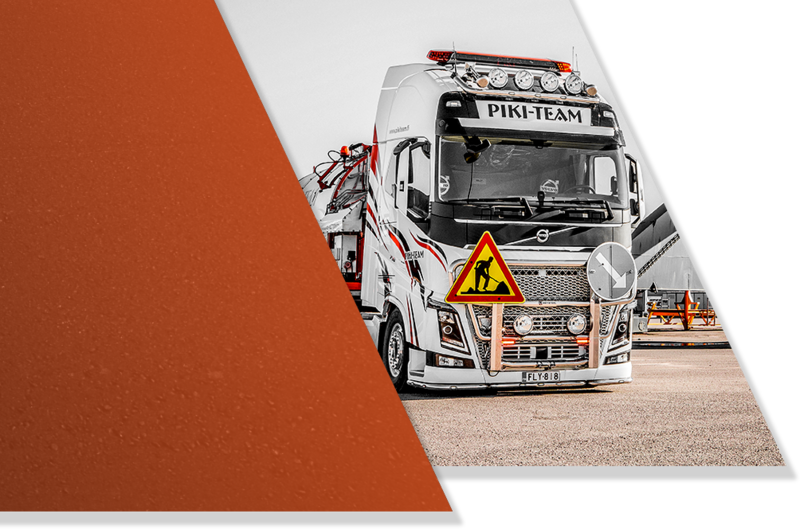 The mechanical KBVA patching method and equipment developed by Piki-Team Oy represent the best expertise currently found in Finland for the repair of 1-10 cm initial perforations and grooves. Our equipment provides utility model protection. As masses, we use, e.g. KBVA 4-6 mm rubber bitumen mastic asphalt, VA 4-6 mm mastic asphalt and 3 mm rubber bitumen and soldering mastics. The heat chain of the mass and continuous mixing is not interrupted at any point between the asphalt boiler and the distributor: the mass remains homogeneous and at an even temperature in a closed 1,000 kg mass container, due to the blend and thermostat heating. Distribution is handled in the Dumper by means of the assembled equipment. The work spacing width is 10-100 cm, depending on the requirements of the site. There are separate hydraulic tilters in each spreader that take the road surface changes into account and make the edge seam almost without any indentation. A hydraulic compressor in the spreader presses the casting mass tightly against the platform with 15 kN strength, ensuring adhesion of the mass to the road surface. Adhesion of the mastic asphalt is prevented by means of the liquid gas heating therein. If the patching residue requires gritting, there is hydraulically-operating sanding equipment in the Dumper for the purpose. We have modern milling equipment in our use that also enables milling work in cramped and weight-restricted premises, such as parking garages. With this equipment, it is possible to carry out both fine milling (e.g. removal of road surface markings) and deep milling (e.g. asphalt excavation). Our equipment is fitted with a 50 cm-wide road milling drum, so it is excellently suited for the removal of pedestrian crossing markings. It is possible to set the milling width between 15 and 50 cm. We also offer our customers asphalting, together with foundation work, carried out in a high-quality manner. We provide asphalting service for various applications, for both private and corporate use: we surface streets and roads, outdoor, yard and parking areas, storage areas, as well as other special sites, if necessary. Asphalt surfacing has a long service life, and it is easy to maintain and keep clean. The surfacing solution to be implemented is selected according to the site in such a way that, after the assessment of the initial situation and load of the site, the surfacing solution best suited for the requirements of the site is selected. Asphalt work can be carried out as an overall contract, in which case we serve at all asphalting-related stages on a turnkey basis, from the foundation work of the area to asphalting and the necessary permanent paint markings. Foundation work and asphalting that has been completed appropriately ensure a smooth and durable end result.